Some of the most foul smelling creatures on Earth are known simply as odorous frogs. These amphibians have a normal odor like that of rotting fish, but it's worth braving their disgusting smell for the life-saving substances that coat their bodies. Because frogs live in warm, wet places — the perfect breeding grounds for bacteria — they need to adapt their bodies to repel any potentially dangerous invaders. To that end, frogs secrete chemicals called peptides all over their skin, which function as a safeguard against deadly infections. 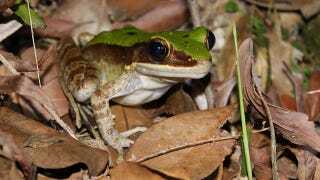 Researchers Yun Zhang, Wen-Hui Lee, and Xinwang Yang set out to find which frogs had the most potent antimicrobial peptides, or AMPs. Out of these 728 AMPs, 662 AMPs were novel and 28 AMPs were reported previously in other frog species. Our results revealed that identical AMPs were widely distributed in odorous frogs; 49 presently identified AMPs could find their identical molecules in different amphibian species. Purified peptides showed strong antimicrobial activities against 4 tested microbe strains. Twenty-three deduced peptides were synthesized and their bioactivities, including antimicrobial, antioxidant, hemolytic, immunomodulatory and insulin-releasing activities, were evaluated. Our findings demonstrate the extreme diversity of AMPs in amphibian skins and provide plenty of templates to develop novel peptide antibiotics. Of particular interest is how some of the AMPs operated. These peptides would both attack bacteria directly and activate the frog's immune system to assist in the battle. It's early days yet, but these AMPs could prove to be of crucial help in fight back against antibiotic-resistant bacteria. If that's the case, we'll have odorous frogs to thank... just remember to hold your nose when you do so. Via the Journal of Proteome Research. Image by motnworb on Flickr.